Earlier this year, our two interns Sarah and Devon spent a few months re-housing and listing the papers of the Hungarian violinist Joseph Joachim (1831-1907), recently donated to the CRC. They share their experiences with us. When I was about eight years old my violin teacher gave me a new piece of music and said, ‘now you get to play a real piece’. It was Joachim’s Hungarian Dance No. 4 and I loved it. It’s remained one of my favourite pieces to play and its folksy, vibrant style inspired my later love of other composers like Bloch and Kreisler. Despite loving his music, I knew relatively little about Joachim the man until I took on this internship at Special Collections. By going through the collection I discovered so much about Joachim, his family, his music, and his life. I also got to meet his relatives and talk about the collection and hear their recollections of the items. Matching the stories to the items I’d been reading and examining for the last two months reinforced the human aspect of the material I’d been working with: such a rare experience! Over the last three months I’ve catalogued what feels like hundreds of newspaper clippings, notes, concert programmes, photographs, and music. I’ve had the chance to brush up my German whilst reading the mountain of obituaries and anecdotes about him, his violins and his performances. There were also notes about his life in Hungarian and a poem in French on the occasion of his death. Buried amongst the newspaper clippings was a handwritten account of a family holiday: I’d never read a more touching portrait of the man. The highlights for me, however, were the photographs. 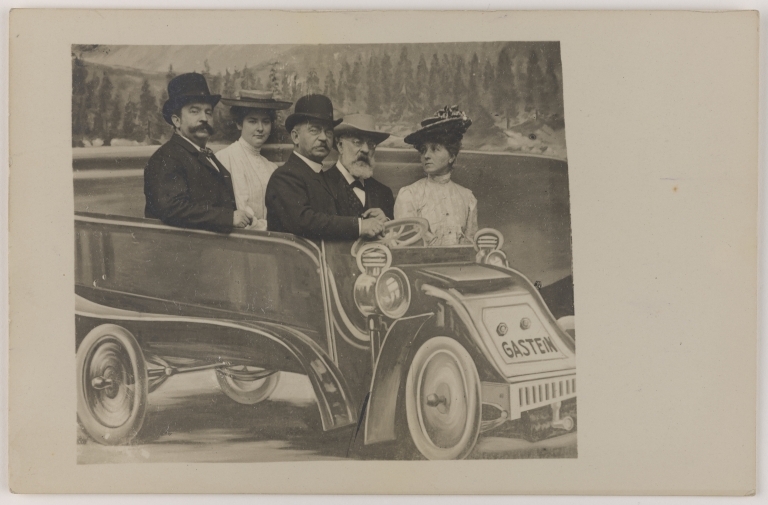 Joachim apparently loved a joke and you can see this in the picture of him in a fake car. The images also captured his pensive side, reading his letters in front of a fire or concentrating on some German verse. 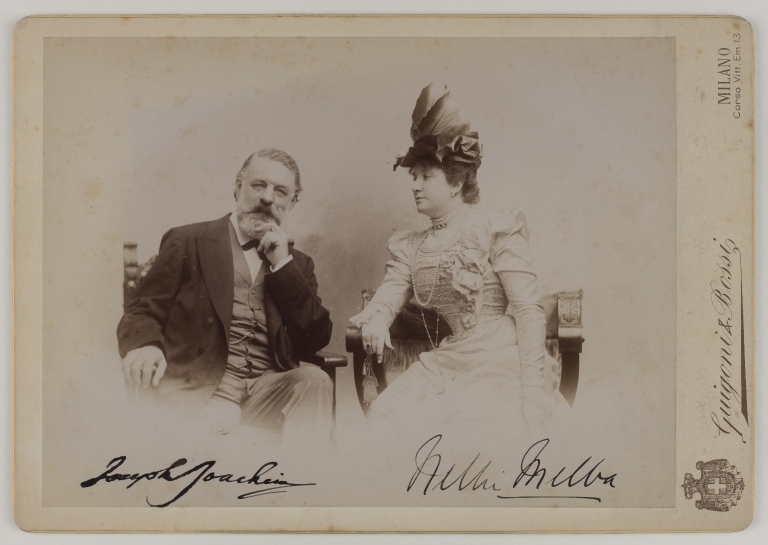 A particularly special picture for me is the one of Joachim with Nellie Melba, a fellow Australian whose alma mater I also attended. Apparently they were great friends with an equally adventurous sense of fun that often perplexed those around them. I like to think you can see a touch of this camaraderie in their portrait. Working with archives is, for me, always exciting. You never quite know what you’re going to come across or discover and so often the material hasn’t been examined in a long time. The Joachim archive was so full of delights and surprises and it exceeded all my expectations. This internship has been a wonderful experience and one I would highly recommend. It would not have been possible without the generosity of the Joachim family and the support of the Special Collections Team and I’d like to thank them both for the opportunity. I’ve learnt so much about the practical side to archive management and processing, but also had an awful lot of fun learning about a hero in the process. I can’t wait for the next one! 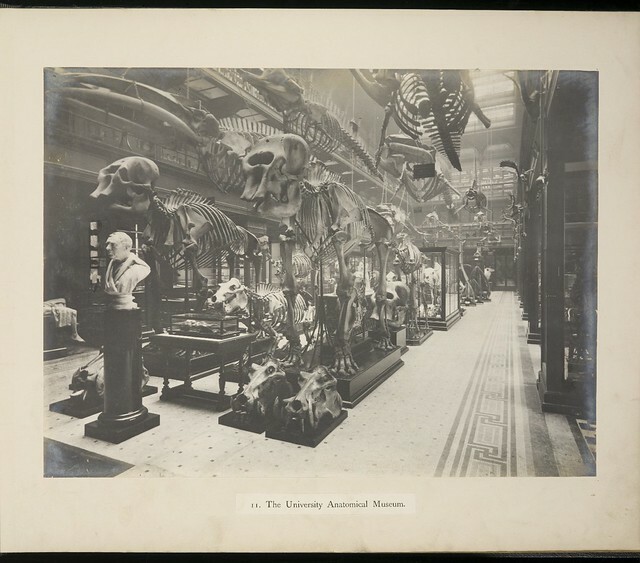 I wanted to be an Archive Intern so that I could learn first-hand the processes behind turning a collection of items into an organised and usable resource. 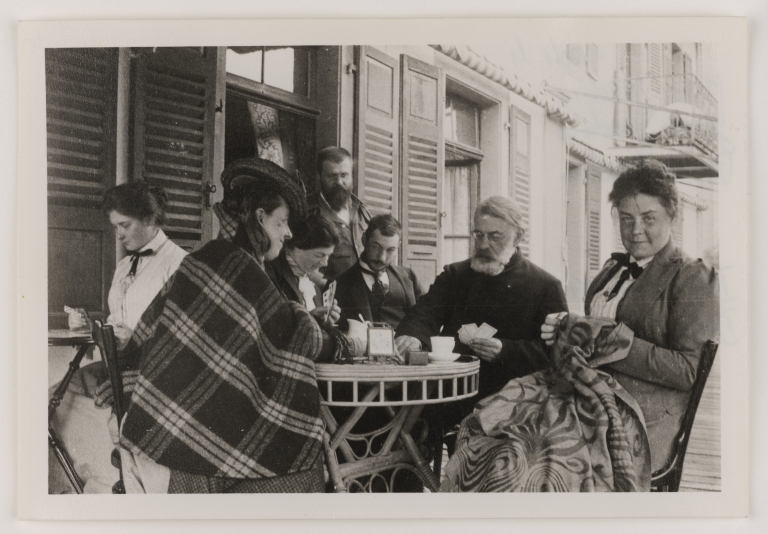 As a Music graduate, it was an added benefit that the archive I would be working on centred around an important figure in classical music – Joseph Joachim. While working on the Joseph Joachim collection I have learned how to box list items, how to identify anything that may need to be sent to conservation, how to think about what items may be useful and beneficial to be digitised, and how to best categorise, arrange, and reference the items as well as a collection of books. I have also learned a lot about Joseph Joachim, both his musical output and his personal life. Shockingly, I had never heard his name even once in my entire four years of studying a music degree and I did not know that he is owed at least in part for helping Johannes Brahms to find success and for helping Clara Schumann to care for Robert Schumann in his final years of critical mental illness. 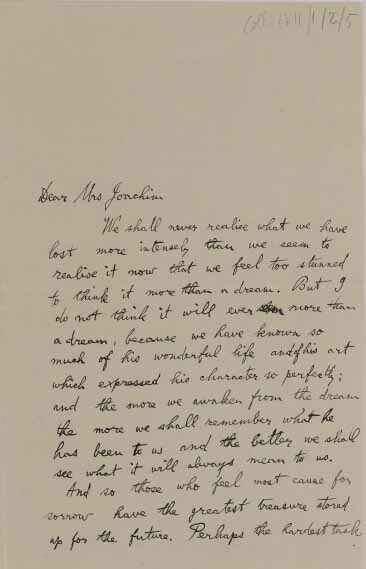 My favourite item of the collection by far was a letter written in 1907 by Donald Francis Tovey. It was written to an unspecified ‘Mrs Joachim’ and concerned the recent passing of Joseph Joachim. The letter is beautifully and poetically written, and really shows the loss felt by the music world. The letter is also important for its personal connection to Edinburgh. Tovey was a composer, musician, musicologist, and close friend of Joseph Joachim. Tovey became the Reid Professor of Music at the University of Edinburgh’s Reid School of Music (from which I have just graduated), and at which there now exists the position of Tovey Professor and the award of the Sir Tovey Memorial Prize for outstanding promise shown in composition or performance. 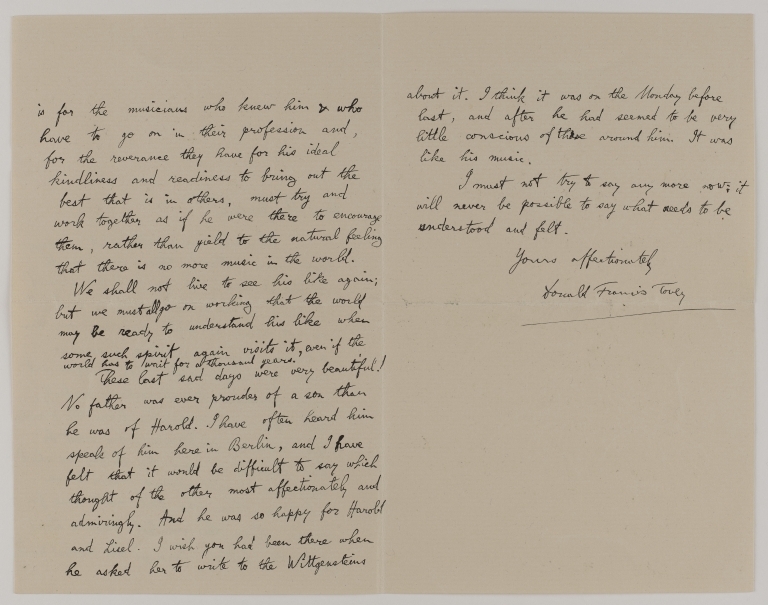 As the university is home to not only the Joseph Joachim collection but also a collection of Tovey’s large collection of books and music scores, this letter is significant and relevant to both, tying them nicely together to both each other and the university. Their fantastic work has enabled us to create a great resource on our online discovery platform, ArchivesSpace. Click here to see the catalogue.